Many people use the two words interchangeably. But they really do refer to two different forms of window coverings. Windows blinds are generally considered a “hard” window covering. 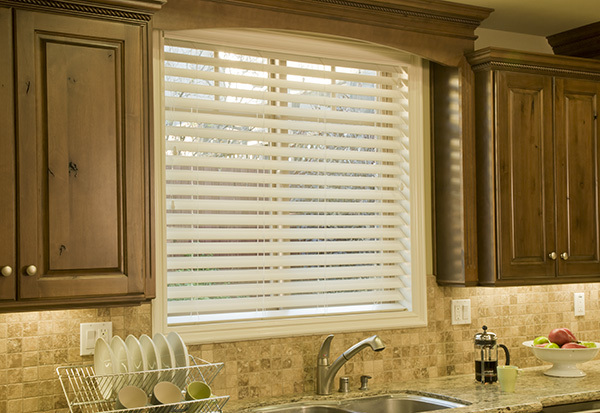 Blinds are made up of individual slats of stiff material that stack when raised or when retracted to either side of your opening. 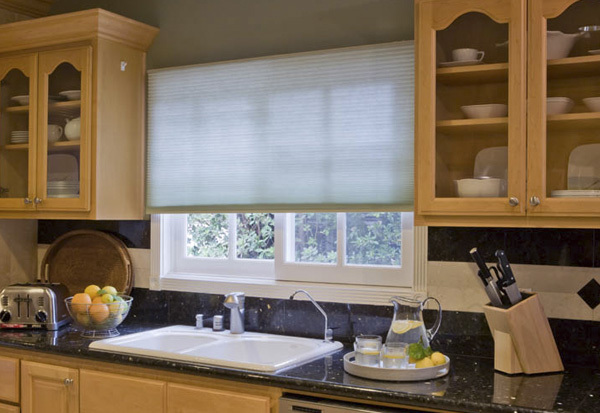 Blinds allow for no coverage when completely open or the slats can be rotated, while the blind is partially or fully closed, to allow for variable coverage. They are most commonly made of vinyl, wood, or metal. Window shades are a “soft” window covering. They are made of a continuous sheet of flexible material. They can be raised or lowered causing the shade to gather or roll up onto itself to adjust light/privacy. In some types they can even be retracted from the top down and the bottom up simultaneously. They are most commonly made of fabric or vinyl. Soft not only applies to the material being flexible in form it also applies to it’s visual appearance. Shades are very often made of somewhat translucent materials giving the treatment a more softened appearance compared to blinds. Author fsparks2014Posted on March 27, 2015 January 28, 2016 Categories UncategorizedTags faux wood blinds, Window Blinds, window coverings, Window Shades, Windows blindsLeave a comment on Blinds and Shades are the same aren’t they? 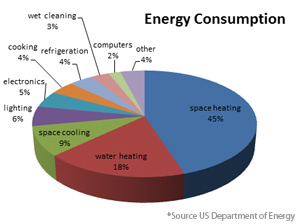 Heating and cooling costs can represent 54% of your energy bill. The older your home the more money you spend to maintain a comfortable temperature in your home. Why, because older homes were built with less energy efficient methods and materials. Homes built between 2000 and 2005 used 14% less energy per square foot than homes built in the 1980s and 40% less energy per square foot than homes built before 1950. Improvements in the products that go in your home and how your home is built have kept energy consumption per square foot about even for the last 30 years. Inflation and increases in the average size of homes means the average home owner is spending more on energy every year. It’s easy to see why upgrading areas of your home to more modern and efficient products can save you money. When your home was built it probably only included standard insulation. If this is true consider adding a radiant energy reflection insulation like Esheild 11000 to your home. It reflects back 97% of radiant heat hitting it. Radiant heat accounts for 93% of the heat energy coming into your home via the attic during summer and 50% of the heat loss via your ceiling in the winter time. It is installed on the underside of your roof to keep the heat out and on the floor of your attic to keep heat in. Older less well made windows are another area your home allows outside weather to affect your home. Window technology has come a long way. Glass can be coated with filter films to protect your home from sun damage while reflecting other spectrum’s of light that heat up your home. Multiple panes of glass with inert gas sandwiched between the panes increase the insulation value drastically over just a single pane of glass. In addition to more energy efficient windows consider adding storm windows. Storm windows are added to the exterior or interior of your existing windows. Storm windows aren’t normally left up year round. When not needed they are removed and put in storage. Any entrance/exit to your home is a location for heat loss or gain. Doors don’t have the same insulation value that a wall has and it has seems that can allow air in or out. Adding a storm door to the exterior or your door will boost the insulation and provide a better air seal. In addition you gain the added ventilation or light options a storm door brings. If you are considering changing your siding then it’s time to consider spending more and getting insulated siding. What’s in your homes walls can’t be easily changed without a lot of effort so it’s an ideal opportunity to increase your homes overall energy efficiency while increasing your homes beauty. Give K-Designers a call 800-728-3902 or visit us online www.k-designers.com and we’ll walk you through all of these options and more. It’s that time of year where rain or snow will start to move you indoors for the winter. But maybe you don’t need to move indoors just yet. 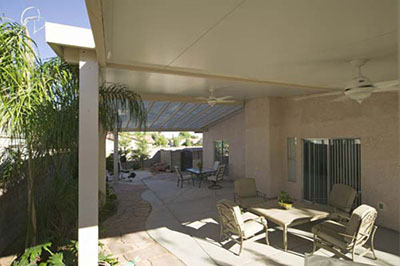 Solid patio covers like America’s Dream Kookshade can truly extend the length of time you can enjoy your outdoor spaces. Koolshade is a coated aluminum product that comes in a lattice (or beam) variety and in solid sheets. This means you can mix the two coverage types giving you 100% shade and weather protection in one area and use the lattice in another area to provide shade or in the case of an attached patio cover still allow light in through covered windows or doors. 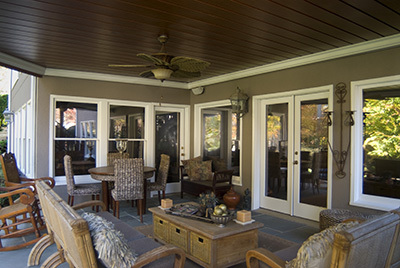 Another way to make those outdoor spaces usable for longer is an underdeck system. Underdeck systems like Ultimate Underdeck are installed under an existing raised deck. They create a water barrier that channels water from rain and snow away from the area under the deck. Now light fixtures and less weather resistant materials and products can be used without worrying about a sudden rain storm. Of course the temperature is also a factor in staying outside so adding a heat source of some sort will fully enable extending your use of that outdoor space. If you are interested in America’s Dream Kookshade or Ultimate Underdeck or any other remodeling project contact K-Designers 800-728-3902 or www.k-designers.com. We can help make your home more enjoyable. I’ve chosen Vinyl as my siding, now what? When building a new home, or remodeling an existing one, vinyl siding is now the most popular choice for siding. Not surprising with its affordability and versatility. But with it being so popular how do you make your home stand out compared to your neighbors? 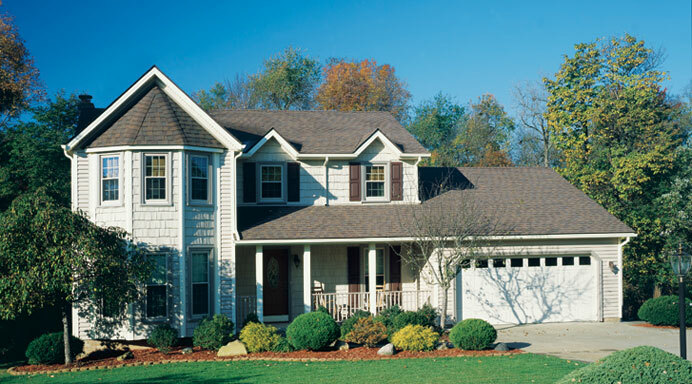 Vinyl siding is a very versatile siding material all by itself with a variety of options built in. Board type, installation method, color, and designer elements are all choices you can make to create a unique look to your home. 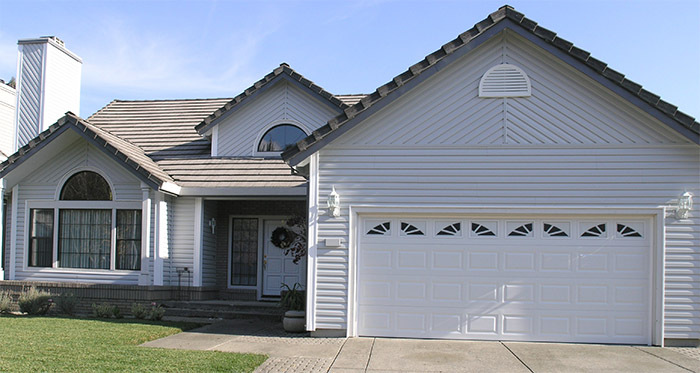 Vinyl siding is made to imitate a real wood siding installation. The most common styles appear to be strips of overlapping boards installed running horizontally in rows, bottom to top. Because styles have varied over the years there are a variety of standard board widths (4” to 8” ) to choose from. Shakes like standard vinyl siding has a wooden counterpart. If you aren’t familiar think of old style wooden shingles except they are installed as a siding material instead of on your roof. There are a few different styles of shake from a little more uniform to more rustic and random. Scallops are a little different in that the exposed end is rounded into a half circle. You can use either of these styles to cover your entire home or just as an accent to your primary siding choice. As I mentioned board style siding is primarily installed horizontally on your home. But some styles, like Board and Batten, are meant to be installed vertically. Any horizontal style siding can be installed on a slant to add visual interest to your home. If installed this way the angle usually matches the pitch of your roof or it’s done at 45 degrees. It used to be that your color options were limited to maybe three, now you have over a dozen standard colors with several designer options to choose from. Vinyl accent pieces give your install a custom and stylish appearance. Some like trim or wraps can match, contrast or harmonize with your main siding color. Other designer elements like headers, keystones, shutters, pilasters, sunbursts etc. come in a reduced color pallet since they are meant to make a statement by contrasting. As you can see plenty of options to make your house truly custom with just vinyl, but if that just isn’t enough you can mix your siding materials. Accenting your foundation or breaking from one material to another based on the architecture can certainly add style to your home’s exterior. The most common pairing is probably brick or stone, but any siding material can be mixed if done with a little planning. If you are looking to bring new life to your home let K-Designers guide you through the choices. Call 800-728-3902 or visit www.k-designers.com. Author fsparks2014Posted on April 7, 2014 April 4, 2014 Categories UncategorizedTags k-designers, siding, Vinyl sidingLeave a comment on I’ve chosen Vinyl as my siding, now what? So do you want grids with that? Grids? When talking about windows it’s not an unexpected question. Grids refer to dividers installed on the interior, exterior and even in between the panes of your window. They are used to imitate a particular design style or construction method. An example of a style of window is Colonial. Windows of this type are characterized by multiple (6-20) smaller panes of glass (or lites) which are all the same size. But window makers don’t really make true Colonial style windows anymore. In the past glass was the single most expensive part of a window. Flat sheet glass was difficult to produce especially in larger sizes. This led to windows being made up of smaller pieces held together in a grid or frame up to whatever size window they wanted. Now glass is produced in larger sheets and cut down to most standard window sizes making glass no longer the deciding factor in how a window is made. There are other factors in how a window looks, primarily energy efficiency, but for the most part the consumer can choose style as the main deciding factor in choosing a new or replacement window. Window grids help greatly in making a window unique, conforming to the neighborhoods overall design (so your home doesn’t stick out) or to simply match your homes existing style when updating outdated or damaged windows. Grids are made of a variety of materials (vinyl, aluminum, fiberglass etc) and come in a variety of styles and patterns. Depending on the manufacturer and model you might even be able to create your own grid lines. Grids aren’t just for windows. They apply to doors as well. Doors comprised primarily of glass are usually made by a window company and come with most if not all the same features. This comes in handy when you want your window grids to match your sliding glass door. 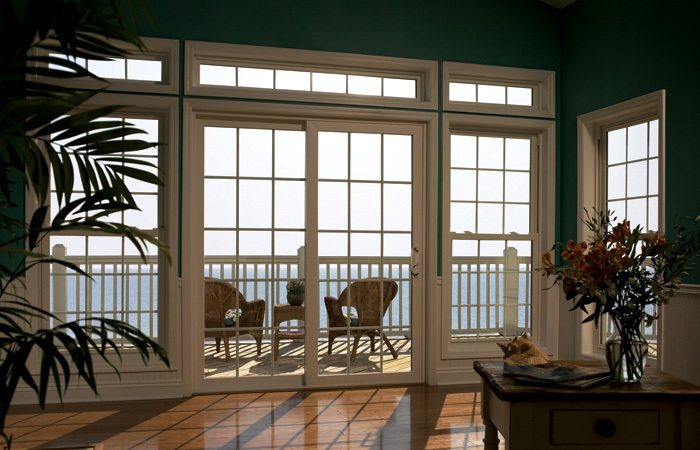 If you are looking for new or replacement windows or patio door for your home, or are looking for more information give K-Designers a call 800-728-3902 or visit www.k-designers.com. Author fsparks2014Posted on March 25, 2014 Categories UncategorizedTags windowsLeave a comment on So do you want grids with that? This is the first post of hopefully many. Stay tuned! K-Designers Home Remodeling Blog at WordPress.com.